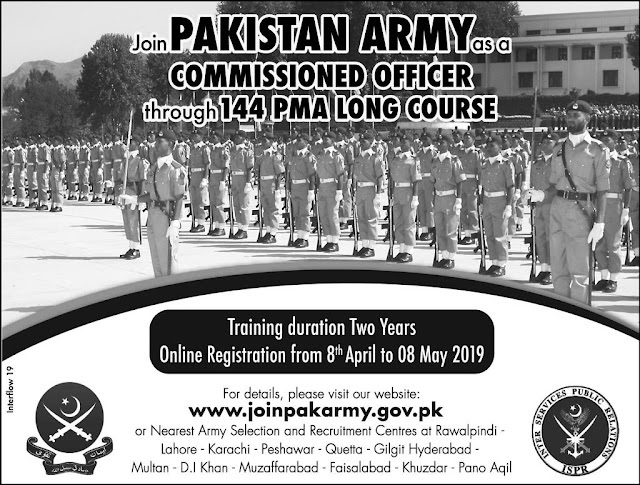 Pakistan Army announced the Long training course for selection of Commissioned Officers April 2019 : Vacancies 1300 : The Best Opportunities in Pak Army for Talented Candidates as Commissioned Officers, Monthly Salary Start From Rs. 30000+ . That course will for 2 years. Qualifications & Age Limit: FA, FSC, BA, BSC, Overall Pakistan Unmarried Males have age between 17-24 years. Height 5 feet 4 inches. If you have any Question, Please post in comment, Thanks !